Wedding PR: Brides.com, Huffington Post, and more! Happy October everyone! 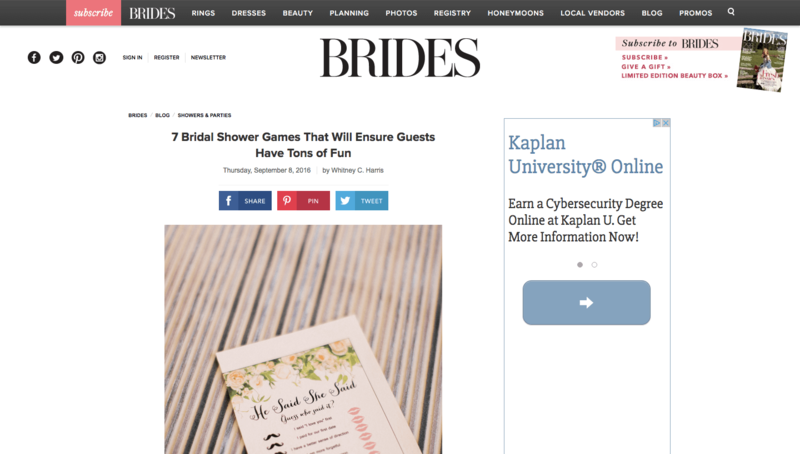 We are so excited to share some of our recent client features including Bridal Guide, Huffington Post, and much more! See it all below. Belladeux Event Design was featured on Brides.com in the article 7 Bridal Shower Games That Will Ensure Guests Have Tons of Fun. See the full feature here. Taylor’d Events, Sunshower Photography, NOLA Weekday Weddings, Wente Vineyards, Weddings Unique, Don Mears Photography and Be Photography were featured in the Huffington Post article Weekday Weddings: To Do or Not To Do? See the full article here. OFD Consulting was featured in Bridal Guide in the article How Much Would Your Favorite Big-Screen Wedding Really Cost? See the full article here. Taylor’d Events was featured on WeddingWire EDU in her guest article Becoming an Entrepreneur in Someone Else’s Business. See the full feature here. Fantasy Sound Event Services was featured on Special Events with their guest article The Latest Trends in Drapery and Chandeliers for Special Events. See the full feature here. Stephanie Yonce Photography and Where Will They Stay? were featured in the Brides.com article 10 Fun Location Ideas for Your Fall Engagement Photos. See the full feature here. Destination Weddings was featured on Book More Brides with their guest feature 4 Destination Wedding Trends for 2016. See the full article here. Taylor’d Events was featured on Carats & Cake with a Seattle Real Wedding. See the full feature here. Fantasy Sound Event Services was featured on Timeline Genius with their guest blog 2016 Lighting and Event Trends. See the full article here. OFD Consulting was featured on Catersource with the guest blog Kosher Innovations: The Future of Jewish Event Catering. See the full feature here.